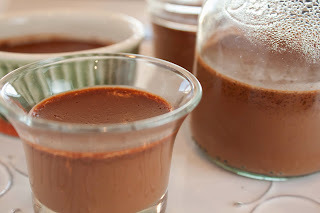 Fat and Happy Blog: Chocolate Mousse Cups: Gluten, Dairy and Sugar Free! 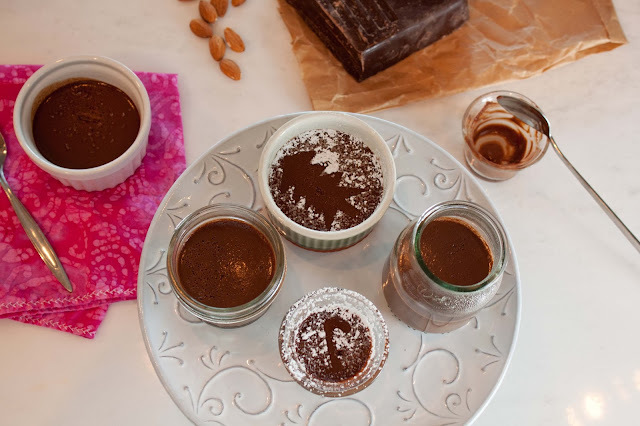 Makes 4-8 servings, depending on the size of ramekins you use. Place the coffee beans, almonds and water in a pan- bring just to a simmer, cover and remove from heat. Let steep for 15 minutes. Preheat the oven to 325 degrees. Set the ramekins in a pan with tall sides, like a cake pan. Bring water to a boil, enough to pour into the pan and come up to half way on the ramekins. While the oven is preheating and the water is boiling: place the coffee beans, almonds and water in a blender, blend on high for 2 minutes. This will chop the nuts and beans and create infused almond milk. Strain the mixture into a pan using a fine mesh nut strainer and set over medium heat. Add the maple syrup and bring to a simmer. 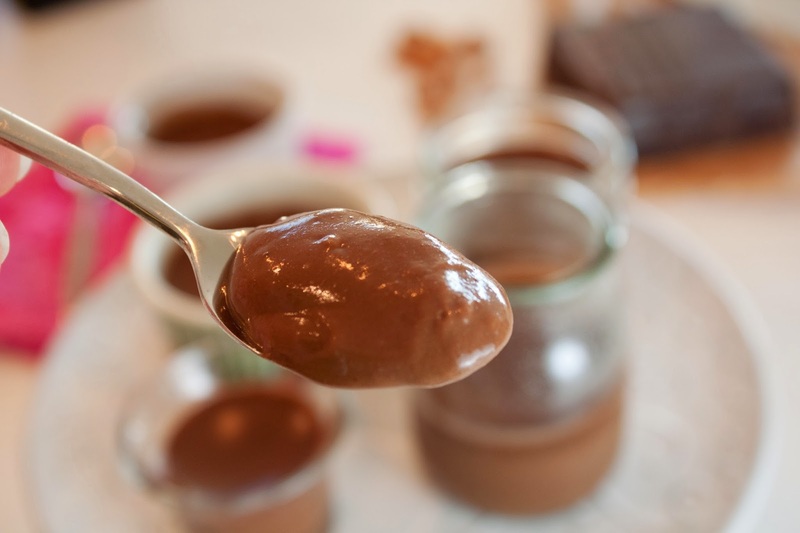 Remove from heat and add the chocolate, whisk until melted. Add in the vanilla and Grand Marnier. Place the yolks in a bowl and whisk to break up. In a very, very slow stream add the hot chocolate milk to the eggs while whisking. Pour the chocolate mixture into the ramekins, fill the pan with boiling water half way up the ramekins and place in the oven. Bake for 30 - 40 minutes until the puddings are set. Remove from the oven and take the ramekins out of the pan. Cool slightly and serve warm or cool to room temperature, cover and place in the refrigerator until read to serve for up to 3 days. Thank you for sharing! It looks so yum!